Flagship Fleet Management " The Web Based Future "
Comments: I had been on the search for 5 years reviewing all the major Fleet Management systems and talking with other Managers about there Fleet Management systems. When I happened upon Flagship Fleet Management, at a conference and after reviewing the possibilities, benefits and how it would fit the business needs of our operation. I was inspired by the possibility with the New Web Based Fleet Management system. After implementing the new system we have been able to get everybody in the shop involved in using the Flagship Fleet Management system from all aspects of the Fleet operation. Data Input, daily time tracking, pictures, documents, service planning, work request module, parts center, motor pool module, sublet invoicing, fuel down load input, reporting, billing, and much more. The largest change for us has been that the data can been accessed any time anywhere with any device very efficient. Area's that have been a challenging to deal with in the past for our operations were documents, special instructions documents and pictures, and other data is all now just part of the data base for that specif asset. Not spread out across different systems and paper files. Faster retrial for the Technicians all with faster repair times in mind and less time on data input into the Software system. The Flagship staff has been very helpful and professional with all aspects of the process. I have enjoyed the team effort in the change over and continued support they have provided. I recommend that you take a look at there Flagship Fleet Management system if your in the market for New Web Based Fleet Management Software with large capability's. Comments: I began working with Flagship Fleet in 2008. I originally contracted with them for their Navigator, Compass, and Fuel Processor modules. I was having difficulty with the reporting capabilities in the system I was using. They effectively provided an interface that allowed me to create and run a multitude of reports using the existing data. They also provided a much more efficient fuel processing system in order to capture the data I needed to generate monthly customer billing reports. Since then I have added the replacement scoring module that allows for accurate replacement analysis, a billing module that allows us to accurately and efficiently generate a monthly billing for all the internal charges we collect from our user departments, and most recently a web based full fleet management system to replace the old FMIS I was using. 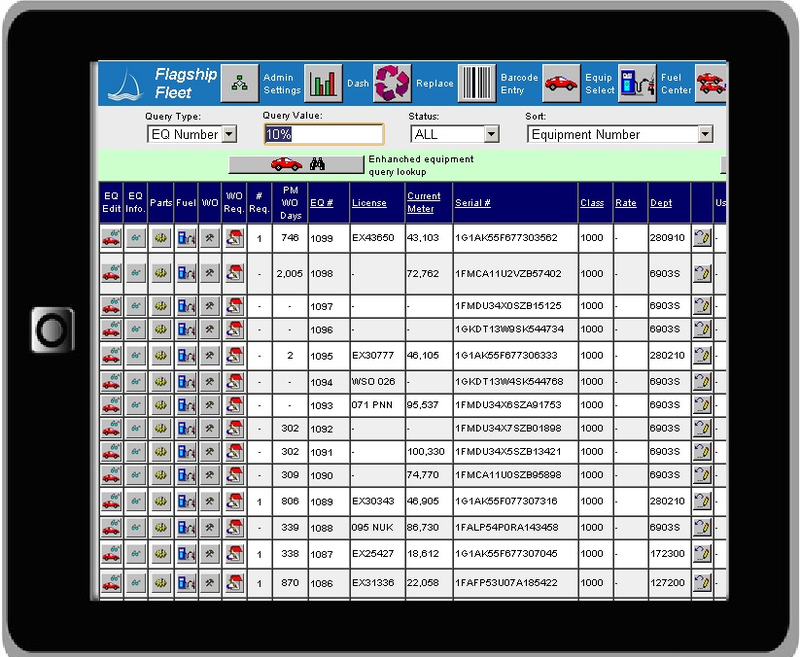 Flagship Fleet Management now provides all of the necessary FMIS tools, asset management, fuel management, work order management, parts management, and replacement and budget analysis. Everything I need to manage a fleet with over 1,000 managed assets. They are customer service driven and provide superior technical support compared to what I was getting from my previous vendor. I highly recommend Flagship Fleet Management for all of your FMIS needs. Flagship is an excellent web based fleet management program. Comments: Flagship is an excellent web based fleet management program. After having firsthand experience using their product, I would highly recommend this to fleets both large and small. Their reporting and management systems are outstanding and can be tailored to suit your specific needs. The professional staff provides exceptional user and customer support. All of this is available by connecting single or multiple tablets, smart phones, or computers to multiple sites for maximum user efficiency and versatility.